What do Pat Gohn and Danielle Bean have in common? I met Pat live and in person at last summer’s Catholic Writers’ Guild Conference. She is warm and engaging, a wonderful listener who immediately hugs you upon recognition. But before I’d even met her in person, I’d appeared on her podcast and we’d had several fun and inspiring Twitter exchanges. If you haven’t found her podcast yet, what are you waiting for? I’ve followed Danielle Bean for close to 10 years–I found her through Franciscancards.com and looked forward to the daily blogs and stories that were posted in their daily newsletter. 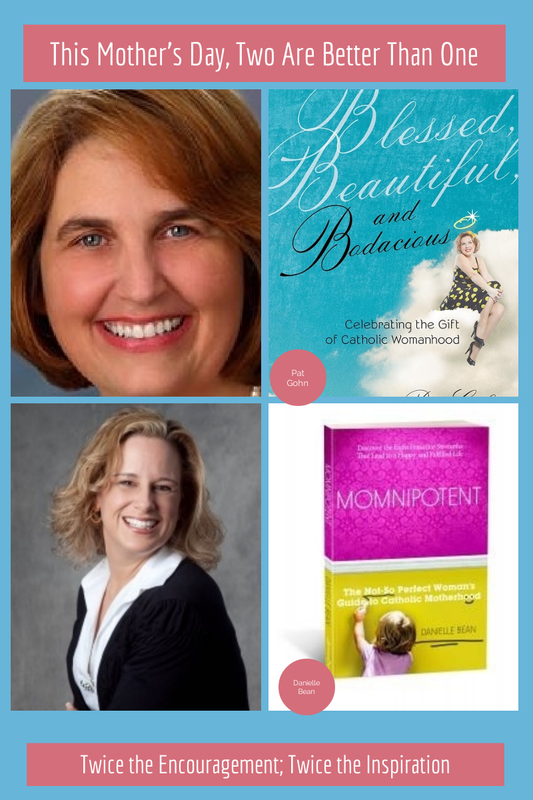 Danielle has since written several books; she appears on The Gist and is editor of Catholic Digest magazine. I haven’t met her in person yet but can vouch for the deliciousness of her Beer Roll recipe. Pat Gohn’s book, Blessed, Beautiful and Bodacious, was published last year. Danielle Bean’s new book Momnipotent has been out only a few weeks, and I haven’t gotten to read all of it yet. But I’ve read enough to know that these two books are perfect companion volumes. If you’re looking for a Mother’s Day gift for that special woman in your life, I highly recommend this pair of books. Tie them up with a ribbon and attach a gift card for her favorite coffee shop. There’s nothing like the gift of peace, encouragement and understanding on Mother’s Day. I don’t know any mom who wouldn’t love that.